We started receiving reports of “black spot” disease in lower Deschutes River bull trout a few weeks ago. 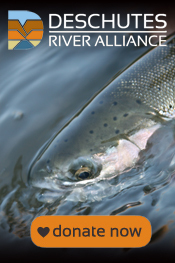 The first report was from Andrew Perrault from the Gorge Fly Shop in Hood River. He sent along these photos and it is pretty easy to tell these black spots are not normal on bull trout. Many of us know that bull trout are species Salvelinus and thus members of the char group. These fish don’t have black spots as normal coloration. Close up of lesions assumed to be due to black spot disease. Photo by Andrew Perrault. Black spot disease on lower Deschutes River bull trout. Photo by Ryland Moore. Since that first report we’ve heard of other observations of black spot disease on both bull trout and red band trout. The presence of black spot disease has been confirmed by sources at Oregon Department of Fish and Wildlife. Black spot disease is caused by a flatworm (trematode) parasite known in the scientific community as Uvulifer ambloplitis, and also known as “neascus”. This parasite has a complicated life cycle that starts with eggs in water, which hatch and become juveniles known as miracidia, which in turn infect aquatic snails. In snails this form of the parasite matures into the next life form, known as cercariae. Cercariae are shed by the snails and become free swimmers, which attach to fish. Once the cercariae have attached to the flesh of fish, the fish develops an immune response that causes the dark spot. Kingfishers are the next host, which become infected when they ingest infected fish. The cercariae develop into adult flatworms. The parasite then produces eggs, which are shed in feces by kingfishers, and deposited in water where the life cycle is reinitiated. Black spot flatworm. Illustration by Bruce Worden. These flatworms do not appear to be fatal to fish, or other hosts. There are scattered reports of fish stressed from other sources dying while infected. No human infections have been reported, but there is no real surveillance mechanism to detect human infections. Although probably safe for human consumption after thorough cooking, there are no study data to confirm that. None of us who have fished the lower Deschutes River for decades can say that we’ve seen many, if any, fish with this condition. There are reports indicating there have been infected fish in the lower Deschutes River and tributaries in the past, but they aren’t common. So what has changed? Is this random? Or linked to the ongoing ecological changes we are all seeing in the lower river? This might be related to an increase in the snail population in the lower Deschutes River. Portland General Electric’s Year 1 Data Summary Report from their Lower Deschutes River Macroinvertebrate and Periphyton Report Study published in 2014, indicates that there has been a significant increase in snail populations in the lower Deschutes River. This increase in population in the intermediate host (snails) might be related to the increase in black spot disease noted in fish. The snail population increase is likely linked to the increase in algae in the lower river. Is this a catastrophic occurrence? Probably not. But it could be another indication of ecological change in the lower Deschutes River. On March 4, we posted two new reports under the “Reports” tab on our website. The first report is the analysis of our 2014 thermal imaging survey of the lower Deschutes River. This report is the analysis of the first known thermal imaging look at mid-summer temperature behavior in the lower river. There were many unanticipated surprises from the imaging, but two findings are of greatest importance. The thermal behavior of water discharged from the Pelton-Round Butte Complex during nighttime hours is unaffected by “canyon effect.” Canyon effect warms the water during the day as a product of solar radiation exposure. Nighttime discharge, however, avoids much of the daytime warming effect. Yet all temperature calculations used for temperature management by dam operations act as if water temperature and temperature behavior are the same day and night. It has also been stated by the dam operators that “cooler temperature discharge from the dams wouldn’t make any difference” because of “canyon effect.” Our findings contradict that. Solar radiation (down-bound long wave radiation) is far more important than air temperature in determining river temperatures. Solar radiation warms both air and the water in the river. That means that shade from canyon walls and riparian vegetation is important in maintaining cooler water in the river. Air temperature in Redmond is also an important factor in determining the goal for temperature management for dam discharge, yet air temperature has little effect on water temperature. The second report describes our data and findings from the 2015 water quality study we did in Lake Billy Chinook and in the lower river just below the Pelton-Round Butte Dam Complex. The Selective Water Withdrawal Tower at Round Butte Dam (the uppermost dam of the three dam complex at Pelton-Round Butte) has intake portals in the top 30 feet of the reservoir, and at 265 feet of depth. To better understand the water quality effects of Tower operations and selective water withdrawal, we sampled surface water and water at depth in front of the Tower, as well as in the river below the dams. Surface water withdrawn from Lake Billy Chinook, for much of the year, consists primarily of water from the Crooked River Arm of the reservoir. Water from the Crooked River Arm is warmer, and of poor water quality (the Crooked River water quality above the reservoir is rated as “poor” by Oregon Department of Environmental Quality). Plus, the water in the Crooked River Arm supports the densest level of algae growth in the reservoir. In contrast, water from the Metolius River, which, because of its colder temperature constitutes most of the water at the depth of 265’, is of high quality (based on ODEQ data, as well as our own data). What is the “nutrient load” entering Lake Billy Chinook from the three tributaries, and when does it get discharged from the dam complex into the lower Deschutes River? Algae in the upper water of the reservoir actually help decrease nutrient levels during summertime growth, but nutrients in surface water discharged in late fall, early winter and spring are not likely attenuated by that algae, and probably contributes significantly to the growth of nuisance algae that has been documented in the lower river. So we are now tracking nutrient levels at the surface and at depth in the reservoir and below the dams. Is the surface water in the Crooked River Arm of Lake Billy Chinook too toxic for migratory juvenile fish survival during major algae blooms due to high pH, high temperature and/or other variables? Is operation of the dam complex in compliance with the water quality requirements of the Pelton-Round Butte Section 401 Certification under the Clean Water Act and the Federal Energy Regulatory Commission license? We would also like to announce that we are (finally!) getting some of our raw water quality data posted on our website. We are open-sourcing the data for all to view or use. It will take some time to get everything posted, but we will be working on this going forward. We hope to post updates on our work throughout the year. So please stay tuned. Deep and heartfelt thanks to our donors and supporters for making this work possible!